API-KAI-EES (meaning “scabby dried meat” and sometimes translated as “bad dried meat,” also known as Deerfoot), Blackfoot Indian runner; b. c. 1864 on the western plains, son of Natowes-tsitsi (Medicine Fire); he had several wives and several children; d. 24 Feb. 1897 in Calgary. 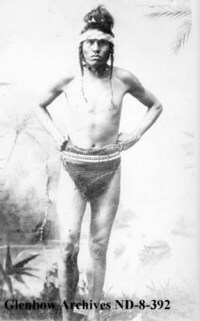 A nephew of Blackfoot head chief Crowfoot [Isapo-muxika*], Api-kai-ees had developed a local reputation for long-distance running on the Blackfoot Indian Reserve (Alta) by 1884 when he was discovered by a Calgary syndicate interested in professional running. Foot-races of all kinds were a popular form of entertainment and gambling, in which local champions would pit themselves against travelling professionals from as far away as Great Britain. Api-kai-ees ran in minor races from 1884 to 1886 when an indoor track was built in Calgary. That year he defeated professional runner James Green and a Blackfoot runner, Little Plume, in a four-day “go as you please” endurance race. He completed 84 miles and 6 laps during the allotted 16 hours. Following this dramatic success Api-kai-ees was given the professional name Deerfoot, used in the 1860s by Ha-ga-sa-do-ni, a Seneca Indian who had set several world records in foot-races at the Crystal Palace in London, England. Api-kai-ees ran in several more local races in 1886. He won the Dominion Day one-mile race and according to the Calgary Herald came within a second of breaking the record for that distance. News of his performances, carried in newspapers as far afield as New York, resulted in the organization of a major ten-mile race that autumn in Calgary. Api-kai-ees defeated J. W. Stokes of Birmingham, England, and Winnipeg runner George Irvine, beating the former by a full lap. The handlers of the British runner, however, claimed a miscount of laps and the race was invalidated. The competition was rescheduled for several days later, but a suspicious Api-kai-ees entered only after Stokes had completed six laps. He nevertheless passed the Birmingham racer and finished the ten miles in 54 minutes 30 seconds. In August 1887 Api-kai-ees’s running career was cut short when he was caught stealing two blankets from a settler’s home near the Blackfoot reserve. Defending himself with an axe, he resisted arrest by the North-West Mounted Police and made his escape. Only a day earlier another Blackfoot had been shot and killed while stealing from a settler. Api-kai-ees’s escape was cause for alarm among the whites of the district, and newspapers, including the Calgary Herald and the Calgary Tribune, wrote of an impending Indian war. Api-kai-ees remained at large for about two years despite a personal appeal to Crowfoot for his surrender by Lieutenant Governor Edgar Dewdney*, a 100-man NWMP search of the reserve, and the offer of a $50 reward. Finally, in the spring of 1889, Crowfoot arranged with Dewdney, now minister of the interior, for his nephew to give himself up. 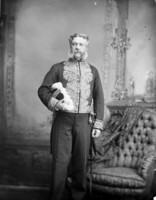 At his trial in Calgary he was represented by influential Conservative James Alexander Lougheed* and received a sentence of six weeks in prison. Foot-racing had declined in popularity by this time and Api-kai-ees never returned to sports. Instead, he was frequently in jail on charges of fighting, drunkenness, and theft. During his time in jail he contracted tuberculosis and in February 1897 died a broken man in the NWMP guardhouse in Calgary. His tragic ending was soon forgotten, however, and Deerfoot was remembered for his exploits as a professional runner. In the 1970s a major Calgary throughway, Deerfoot Trail, as well as an industrial centre and a shopping mall were named in his memory. Can., Parl., Sessional papers, 1887–89 (annual reports of the North-West Mounted Police). Calgary Herald, 10 April 1889. DAB. L. V. Kelly, “4 famed Indians caused white men to bite dust,” Calgary Herald, 30 Oct. 1954. Hugh A. Dempsey, “API-KAI-EES,” in Dictionary of Canadian Biography, vol. 12, University of Toronto/Université Laval, 2003–, accessed April 26, 2019, http://www.biographi.ca/en/bio/api_kai_ees_12E.html.